After they left Florida in 1993, the Van Dams moved to Texas. Then to Arizona. On to San Diego, California and finally in 1998 they moved to Sabre Springs where they bought a home; the home from which Danielle vanished in 2002. In 1999 the Negrete family lived in Sabre Springs too. 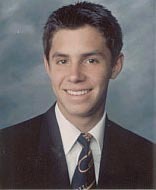 Michael Negrete is a 18-year teen ager who just graduated from Rancho Bernardo’s High school and this fall 1999, he is a freshman at UCLA in Los Angeles. Michael is a talented musician with good grades and a lot of friends; a very popular young man loved by everyone. He lives in one of the biggest dorms on campus. On December 10th 1999, Michael attended a party on his dorm floor on the UCLA campus, with friends they sipped margaritas and listened to music. After leaving the party Michael went to his room and played a computer video game through an intranet connection; competing against a friend that was in another room on the campus. Around 4 am they finished the game. Michael went outside his room to congratulate the other student he was playing against, then went back to his room. Michael Negrete was never to be seen again, his wallet, keys and shoes were found in his room. Police searched the dorm’s garbage and every construction site on campus but found nothing. Investigators tracked down dozens of UCLA students who had lived in the dorm, no one knew or saw anything. The family offered a $100,000 reward. Hundreds of volunteers and friends searched for Michael everywhere and found nothing. Dogs tracked his scent to a local bus stop, that was were the trail ended. At one point police thought they had a lead worth following; witnesses reported seeing a strange man on the dorm floor where Michael lives and were able to provide an accurate description of this man. A sketch was drawn, posted, and distributed. No one has seen this man on the sketch since the night Michael disappeared. 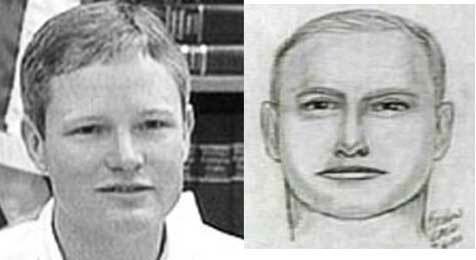 Right: sketch drawn in 1999 portraying the man wanted for questioning in Michael Negrete’s disappearance. Witnesses reported seeing a strange man on the dorm floor where Michael lived and were able to provide an accurate description of this man. Michael Negrete’s disappearance is not front-page news anymore, but, when his suspected abductor’s sketch is pulled from news wire archives I think there is a resemblance with Damon Van Dam. The sketch of Michael’s suspect is beardless. I believe it is coincidental that, since the murder of Danielle, since his picture is all over the news, Damon Van Dam let his beard grow. Police concluded that someone Michael knew had contacted him and had given Michael an incentive to leave the dorm at 4 am on that fateful Friday night. What was it that Michael couldn’t resist? Very simple: a video game party. Is Damon Van Dam like Michael Negrete a video games freak? In 1994, Damon Van Dam, during a late spring cleaning, got rid of computer video games, in 1996 he was unloading video games and joysticks while selling his house in Texas, in 2002 he is playing video games with his sons…. Michael’s mother confirmed, that without any doubt, Michael would have accompanied somebody he knew at any time for a video game party. Is it possible Michael Negrete knows Damon Van Dam? After all, the man is a friend of his father. The Van Dams and the Negrete both live in Sabre Springs, California. Coincidence. Damon Van Dam was at the University of Florida in 1989 when Tiffany Louise Sessions disappeared. Coincidence. Both Brenda and Damon Van Dam lived in Hollywood Florida when Adam Walsh disappeared from the video games area of the toy department of Sears, inside the Hollywood mall..
Coincidence. Damon Van Dam is a video games addict. Coincidence. Damon Van Dam was a friend of Michael Negrete’s father when Michael disappeared in 1999. Coincidence. Damon Van Dam happens to have a resemblance with the man wanted for questioning in Michael’s case. If these coincidences had been found in Westerfield’s background instead of a D.U.I., they would be called “strong leads to follow”. 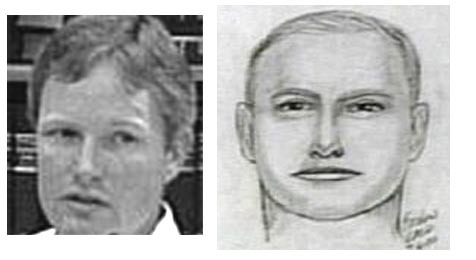 Left: Damon Van Dam in 2002 Right: sketch drawn in 1999 portraying the man wanted for questioning in Michael Negrete’s disappearance.